This short course will help you learn how to develop and use 3D formative assessments in the classroom. Formative assessment in the classroom is crucial because everyone engaged in complex learning benefits from timely and focused feedback from more expert others. The process also promotes important processes of self-explanation, reflection, and learning. One powerful approach to formative assessment is to develop short tests of student understanding that get embedded into an unfolding curriculum unit—allowing for instruction to shift to support student understanding of specific learning goals. The new vision for K-12 science education calls for a new three-dimensional model of science learning. From this 3D integrated perspective, research shows that students learn science best by engaging in science and engineering practices (SEPs) as part of sustained and meaningful investigations as they learn and apply disciplinary core ideas (DCIs) and cross-cutting concepts (CCCs). This integrated approach to learning has major implications for how formative assessments should be developed and used. Here are some activities with linked resources that can help you learn how to develop or refine 3D formative assessments. The sequence assumes that you are familiar with the basics associated with the new vision and the associated equity goals for science education. 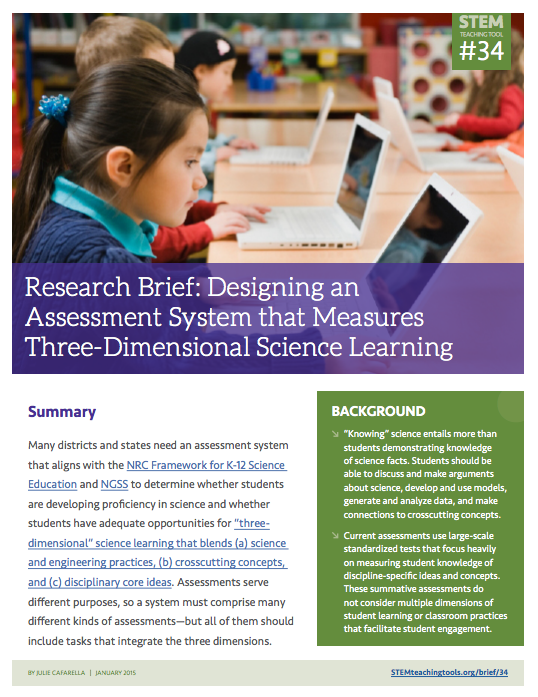 To learn more about the overall approach to assessment for K-12 science education, read about Designing an Assessment System that Measures Three-Dimensional Science Learning and think about what parts of the recommended "system of assessments" that you will be working on. If you need some background on formative assessment, skim this report on Attributes of Effective Formative Assessment and think through how the definition for formative assessment and five attributes relate to the work that you do or could do. To get oriented to 3D assessment development, read about How teachers can develop formative assessments that fit a three-dimensional view of science learning and explore the embedded examples. How similar or different are they to the formative assessments you are familiar with? 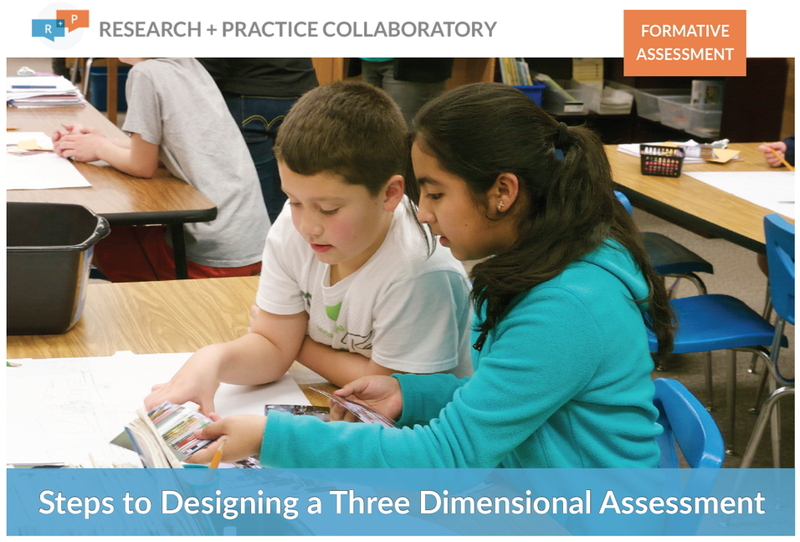 To get started developing 3D assessment items, read How can assessments be designed to engage students in the range of science and engineering practices? and start to map out an assessment cluster you would like to build. To get detailed guidance on a process you can use to develop assessment clusters, sink into Steps to Designing a Three-Dimensional Assessment and use the five steps to guide the development of your assessment cluster. 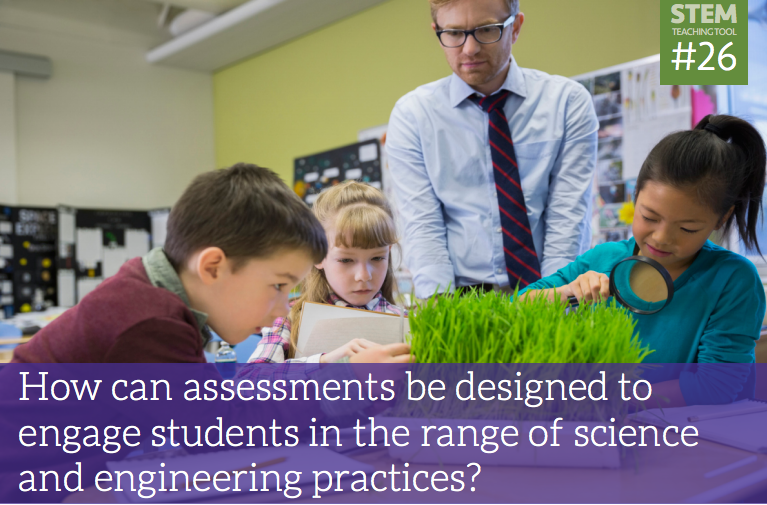 To design assessment items for the range of science and engineering practices in the new vision, use these Task Formats for Science & Engineering Practices to scaffold your design of specific assessment items. This tool get used in Step 3. The following materials come from teacher workshops focused on the development of 3D formative assessments. The slides and resources are worth exploring and leveraging in your own work. Building on students' prior content knowledge is a key strategy for promoting deep learning in the classroom. The NRC Framework for K-12 Science Education -- that guided development of NGSS -- highlighted how it is equally important to build upon students' prior interests and identities during science instruction. Research has shown that building on student interests and experience can make science more relevant, help them identify with science, and learn how science is a human endeavor that has an important role in society. In this workshop, participants will learn how to use different formative assessment approaches to support interest-driven learning in their classroom. These general strategies help students make meaningful connections between the science concepts they are learning and the application of those ideas to their own lives and to other everyday situations -- including the many careers and pursuits that leverage STEM knowledge and practices. The approaches you'll learn in this workshop can be used with any curricula, at any grade level, and in all subjects of science and engineering. How is assessing three-dimensional science learning different than we how we have thought of science learning in the past? How can we design assessment tasks that elicit the core ideas, practices, and crosscutting concepts in the NGSS performance expectations (PEs)? There are very few examples of elementary and middle school assessments completely aligned to NGSS, so people will need to adapt the ones that exist. Performance expectations also under specify the nature of evidence needed to draw inferences about student learning. This workshop aims to help participants identify assessment components that focus on individual practices, core ideas, or crosscutting concepts, and understand how, taken together, the components can support inferences about students’ three-dimensional science learning as described in a given performance expectation. We guide participants through an analysis of common assessment tasks to identify components and qualities of these tasks that support assessment of practices, crosscutting concepts, and core ideas. Tasks examples will will be drawn from all four domains of disciplinary ideas linked across elementary and middle school. Through this activity, participants will review tasks that aim for assessing PEs, discuss strengths of these tasks and gain practice with adapting them to better elicit three dimensional science learning.